A perennial problem of ours is what to do with the abundance of greens we receive every spring from our CSA. Mizuna, spinach, butter lettuces and more so we are always looking for ways to use them other than a drab salad. Salads with a bit of fruit is a recent obsession of ours and this salad fits the bill perfectly. The recipe is nearly perfect as-is for a side salad but required a bit of dressing up in order to make it an acceptable main dish with a bit more olive oil and extra spiciness. This recipe can and should be setup ahead of time. 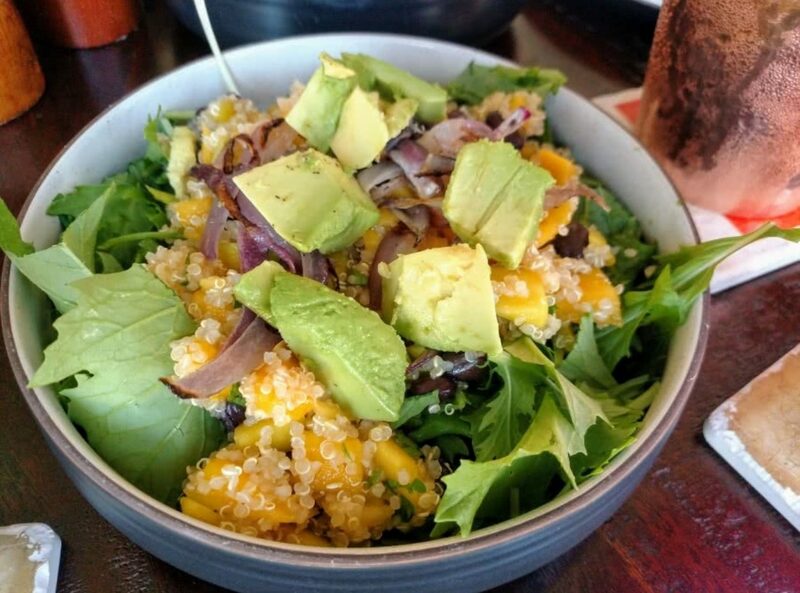 Creating the quinoa, black bean, and mango mixture ahead of time and adding the whole of the dressing to the mixture will allow the flavors more time to meld and provides a more robust flavor. Whenever you are ready to serve assemble the lettuce, quinoa mixture and top with the onions and avocados. We like a bit more spice in our salsa so we added serrano peppers to add a bit more flavor. 3 Mangoes can very a lot in size. We found about 600 grams of mango was the perfect amount.